Xiaobing Wu/Contributing Photographer Jennifer Wegmann, lecturer of health and wellness studies at Binghamton University, talks about stress in the lives of students on Thursday evening in the Admissions Center. The lecture was one of a six-part series offered by the Binghamton University First Year Experience program. 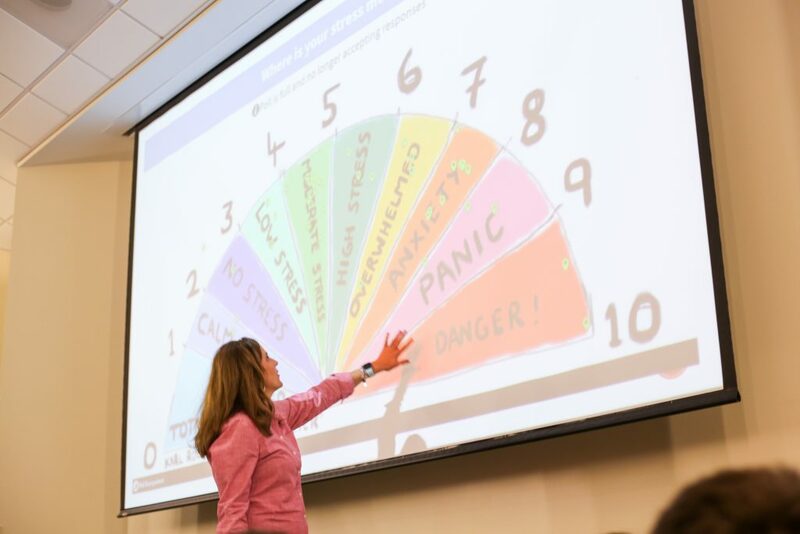 While most people may think of stress as a bad thing, Jennifer Wegmann, lecturer of health and wellness studies at Binghamton University, focused on the benefits of stress during her talk on Thursday. More than 150 students gathered to listen to Wegmann’s lecture and learn how to stop stressing about being stressed. The lecture was part of the BU First Year Experience (FYE) program, and Wegmann’s presentation discussed her research on what it means to be stressed and how students can use the stress in their daily lives to help them be more productive and healthy. Each fall, FYE offers first-year students the chance to take UNIV 101, a two-credit course that aims to have students explore and discuss academic topics, utilize campus resources, develop critical thinking and writing skills and improve their time management. The program also offers a lecture series. Christian Howles, a graduate assistant for FYE and a first-year graduate student studying student affairs administration, said the program is a good opportunity for students to find connections on campus. As one of six lecturers this semester, Wegmann wanted to emphasize the importance of attitude, specifically toward the stressors in students’ lives. Wegmann’s lecture included stories of positive motivation and the power of optimism, as well as the importance of self-care. According to Wegmann, students are less likely to feel as negatively affected by the stressors in their lives by keeping their bodies healthy and having a positive attitude. She employs these methods in her stress management class. For students experiencing particularly high levels of stress, Doug Wehbe, Student Association vice president for academic affairs and a senior majoring in computer science, recommended they seek out campus resources such as the High Hopes Helpline and the University Counseling Center. Students can also attend stress-relieving events organized by resident assistants in on-campus residential communities, such as therapy dog nights or craft activities. However, while using healthy stress management techniques and looking for help is important, Wegmann also advised students to remember stress can be a good thing and a force that drives people to be better and more productive. According to Wegmann, people stress about the things in their lives that hold value to them — such as students stressing about school and grades. Tatum Murphy, an undeclared freshman, attended the lecture as a requirement for the UNIV 101 course, but said the talk changed his outlook on stress.